Skateboarding is an integral part of California culture, so why not make California an integral part of skateboarding? 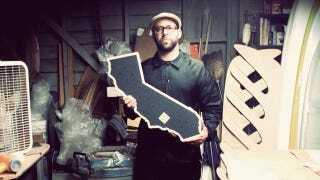 This skate deck, from Evilgoods, does just that—it's actually shaped like California. I'm from California so I'm totally in love with this. That's not bias! And I don't care if you can't really skate with it, just imagining myself on the beach with the sun shining and me cruising by with this California skate deck? Now that's a great day.